Nearly two-thirds of all revenue generated from the top 100 games in the Apple App store in June came from people spending cash inside "free" games, according to a recent study. That means that according to the study by mobile analytics company Flurry, just 35 percent of revenue was brought in by paid downloads. This is a huge shift from back in January, when paid downloads accounted for 61 percent of revenue among the top 100 games, according to Flurry. Flurry also says that all of that money is generated by only 0.5 to 6 percent of gamers. 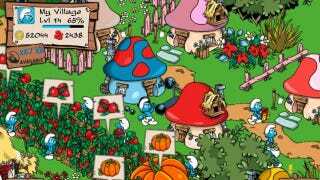 Games like Smurfs' Village and Tiny Tower allow players to use real world money to speed up the game's built in delays.